Dr. Asma Abdullah (2nd left) brings a point across in the presence of Jasmine Begum (left), Paul Oliva (right) and moderator Maztini Ahmad Mahir from the Center for American Education at the forum. Students from the Center for American Education at INTI International College Subang set up an exhibition, which showcased American history and journey to achieving independence. They also participated in an engaging forum on the influences of the U.S. in Malaysia’s business and educational practices. Featuring key speakers Dr. Asma Abdullah, Consultant & Trainer, Culture Matters; Jasmine Begum, Director for Legal and Corporate Affairs, Microsoft Malaysia; and Paul Oliva, Commercial Officer from the US Embassy who spoke on the challenges of living and working in a global market place; the forum not only exposed students to an international panel of experts, but also to political and academic viewpoints on socio-cultural perspectives which departs from conventional classroom wisdom. “We realize the importance of preparing students for studying and living abroad, especially for students in the American Degree Transfer Program. The Center for American Education (CAE) here at INTI has a team of US-trained advisors to provide students with help and advice on university selection, living costs, financial aid, travel tips, social activities and culture. 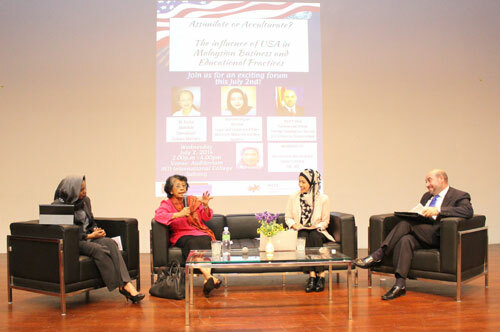 CAE also organizes events such as this forum to provide a greater understanding and appreciation of American culture and influences,” said Lee Chan Yu, Dean of the Center for American Education at INTI Subang. In Penang, INTI International College Penang’s CAE and University Placement Office collaborated with MACEE (Malaysian-American Commission on Educational Exchange) to organize a Pre-Departure Orientation for students looking to pursue their studies in the US. The interactive briefing, which was open to the public, provided insightful information on living and studying in the US, as well as crucial information on financial aid. Joining the celebrations in Penang and sharing their personal experiences of studying and living in the US were INTI’s American Degree Transfer Program alumni on their break from studies at various universities across the US. Having facilitated the transfer of over 11,000 Malaysian students to American universities, INTI – recipient of the United States Department of Commerce’s Certificate of Appreciation for Achievement in Trade – has helped enrich the learning experience of thousands of students in their journey to realize their academic and career aspirations. The American Degree Transfer Program has provided students the opportunity to experience a seamless transition to a choice of over 300 universities in North America, where they have the chance to experience the world in myriad ways, make their own discoveries and realize their true potential through an education that empowers learners.